Montrealers who head out to the Place des Arts this week are in for a real treat. 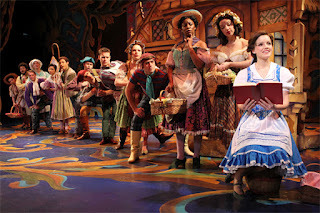 I attended opening night for the Broadway Classic Beauty and The Beast and I must say it was sensational. It continues through Sunday, April 29. Going into this show, previous press coverage touted strong voices in four principal roles: sopranos Emily Behny and Julia Louise Hosack as Belle and Mrs. Potts, and baritones Dane Agostinis and Logan Denninghoff as the Beast and Belle’s evil suitor, Gaston. I was therefore disappointed to hear just before the curtain rose that Agostinis would not be on stage; replaced by his understudy Carter Lynch. Well, Lynch was superb and came across as someone who has been playing the part for some time. I was also interested in seeing Denninghoff in action, having interviewed him by telephone just last week. He was top notch and clearly a crowd favorite, along with Jimmy Larkin as his sidekick Lefou. Disney’s Beauty and the Beast features the animated film’s Academy Award®-winning score with music by Alan Menken and lyrics by the late Howard Ashman, with additional songs with music by Alan Menken and lyrics by Tim Rice. The book is written by Linda Woolverton. This, of course, is the classic story of Belle, a young woman in a provincial town, and the Beast, who is really a young prince trapped in a spell placed by an enchantress. 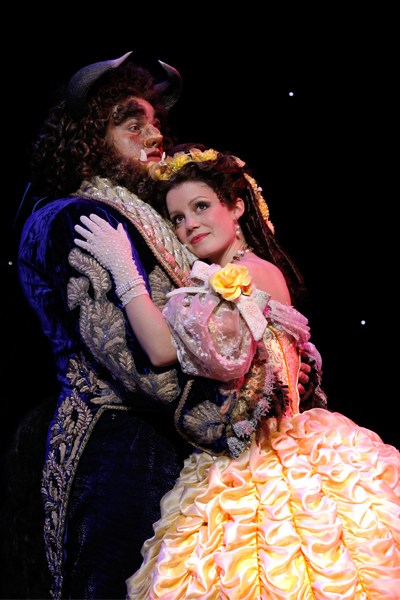 If the Beast can learn to love and be loved, the curse will end and he will be transformed to his former self. But time is running out. If the Beast does not learn his lesson soon, he and his household will be doomed for all eternity. I have seen the movie and one other stage production in the Miami area a few years ago, certainly not at the same level. Yes, I know the story and how it will all unfold. Then why did I still sit at the edge of my seat as the Beast rescued Belle from a wolf attack? As for the music, you just cannot get tired of this score. Behny and Lynch were a treat to listen to. I also must comment on the terrific set and very realistic special effects. In a scene towards the ending where they showed rain and lightning, it looked like the real thing. I even found the wolves to be kind of creepy. David Baur as the carpet showcased some marvelous acrobatics while seven year old Noah Jones was adorable as Chip. Take a look at the final moments of the performance as the actors take their bows. • The musical score of contains six beloved songs from the Academy Award-nominated feature film, one song cut from the film that has been restored for the musical, and 6 original songs written for the musical. • The production uses 81 wigs and 580 costume pieces, including some pieces from the original Broadway costumes and 67 LED lights on the magic mirror. For more details log on to BeautyAndTheBeastOnTour.com. Bravo to Evenko for bringing us this masterpiece. Tickets are on sale at the Place des Arts Box Office, by phone: (514) 842-2112 or 1 866 842-2112 or online at www.pda.qc.ca or www.evenko.ca. Ticket prices range from $56.50 to $89.50 (taxes and service fees included). Next on the agenda for Evenko in terms of Broadway shows is the Tony Award winning Wicked, set to launch here for one full month on August 1.